Wild EatsHow Do You Know Roadkill Is OK to Eat? How Do You Know Roadkill Is OK to Eat? 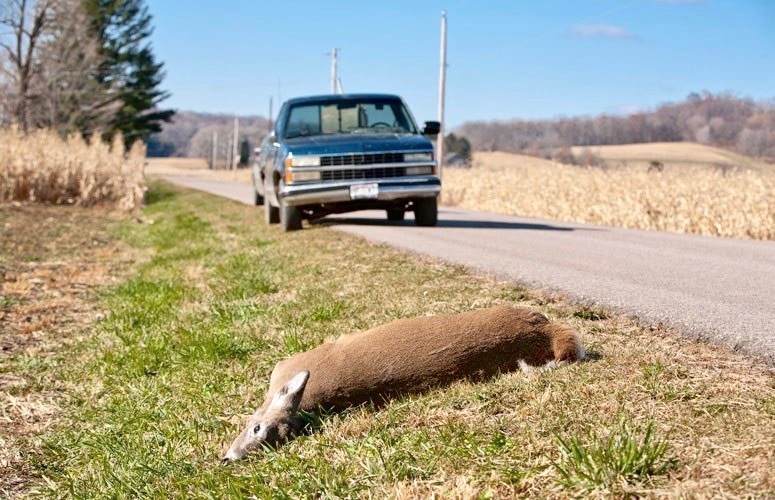 Today 28 states have laws in place making it legal to harvest roadkill for food. But when it comes to meat quality, how do you know roadkill is OK to eat? A year ago, Grand View Outdoors published Yes, You Can Eat Roadkill. The article has performed well. People are clearly motivated to avoid waste — a least our readers are. And in our society of relative wealth, this is encouraging. While the original roadkill story on this website focuses on the legality of eating roadkill, this article answers how one determines if roadkill is OK to eat. A dead animal can give a roadkill scavenger certain signs indicating the freshness of its flesh. Many of these signs can be interpreted by applying common sense. Obviously a warm body and fresh blood would suggest the meat is fresh. If an animal’s eyes are clear, it died recently. Once an animal has been dead for a substantial amount of time, the eyes become milky, an indicator that you should steer clear of consuming the meat. But if you’re not lucky enough to witness the animal’s life expire as it happens, just be sure to avoid eating any animal with a rank odor or bloated belly — and, certainly, swarming insects or circling turkey vultures suggest you should stay far, far away. The cause of death is also pretty important when assessing meat quality. If you’ve ever talked to anyone who has eaten roadkill or does so periodically, you’ll find a lot of animals that die due to vehicle collisions are passed over because of the trauma associated with the animal’s death. Here's an example of the ideal way you'd want your roadkill to die: A super healthy, hardy deer takes on a tiny Pruis with limited horsepower, suffers isolated head trauma and dies immediately. On the other hand, if a deer gets plowed by a Hummer and takes a roll across the hood and spins off the side, it’s a nonstarter. Trauma of this nature bruises muscle tissue, making it bloodshot and inedible. However, often this is difficult to determine until after the deer is skinned. Finally, as the Missoulian suggests, “if tire tread marks are involved, forget about it.” That's worse than a gut shot, leaving digestive juices and bacteria on the loose, mixing and mingling and destroying the animal’s meat cuts. Earlier this year, Oregon became the latest of 28 total states to make salvaging wildlife killed on roadways legal. Here’s a list of states where you can legally harvest roadkill for food. Every state’s regulations are different, so check in with your local wildlife agency to get details concerning its process and requirements. At just a quick glance, you can see the eastern U.S. has more deer collisions — and therefore more roadside deer carcasses — due to two obvious factors: denser deer populations and denser human populations. West Virginians top the list of U.S. states with a 1-in-43 chance of their vehicles colliding with a deer. Conversely, Californians have a 1 -in-1,117 of hitting a deer. Maybe that's why California hasn't made it legal to collect and eat roadkill — pickings are slim. Nationwide, more than 1,900 fatal accidents have been attributed to drivers hitting animals in the road — most of them deer — over the past decade, according to the Insurance Institute for Public Safety.